No. 14 Rush Truck Centers Ford for Stewart-Haas Racing (SHR) driver Clint Bowyer endured a major crisis in March when he last visited Martinsville (Va.) Speedway. Minutes after winning his first Monster Energy NASCAR Cup Series race for SHR, Bowyer ran up into the stands to celebrate with the Virginia race fans. That’s when the crisis occurred. Bowyer finally got his beer and celebrated with the fans. He hopes he’ll get a second chance to drink beer in the crowd this Sunday as the Cup Series returns to Martinsville for the First Data 500 – a race in which the stakes are as high as any this season. Martinsville is the first of the three-race Round of 8 in the Cup Series playoffs that determines the final four drivers who will contend for the title Nov. 18 at Homestead-Miami Speedway. A win at Martinsville Sunday guarantees a place in the Homestead finale. Bowyer enters the Round of 8 fifth in the points but only three points out of the fourth and final transfer position. Bowyer’s No. 14 Ford will carry the Rush Truck Centers paint scheme again this weekend in Martinsville. Rush Truck Centers has been the primary partner on the No. 14 team since Bowyer arrived at SHR in 2017 and has been with the organization since 2010. The Texas-based company has used Bowyer and the team to appeal to NASCAR fans as one way to recruit the technicians it needs to operate the largest network of commercial truck and bus dealerships in the country, with locations in 22 states. According to Rush Truck Centers, the trucking industry is expected to need 200,000 diesel technicians over the next 10 years to keep up with maintenance demands. In addition to his March victory on the flat, half-mile Martinsville oval, Bowyer owns six top-five finishes and 14 top-10s in 25 starts there. Located just 90 minutes from his Mocksville, North Carolina home, Bowyer says the facility reminds him of the roots of the sport. The pictures of his family running down the front stretch after the victory in March were some of the season’s best. “Martinsville for me is my new home track,” he said. “Everybody lives down in the Charlotte area. We live up north, Winston-Salem area. That’s my home track. That’s the one racetrack you drive back and forth on qualifying day then go back up there for the race. 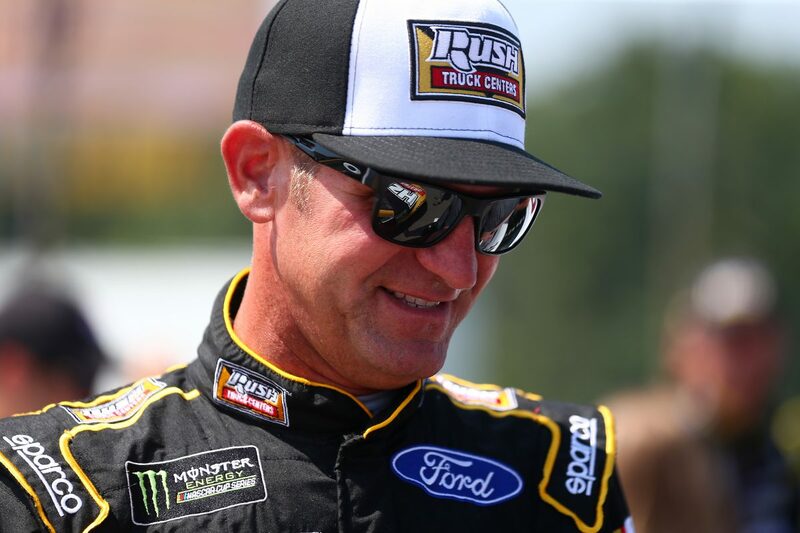 Bowyer is part of a four-Ford SHR contingent that put all four of its drivers in the Round of 8 – the only team to do so in 2018. SHR owns 11 victories and each of its four drivers has visited victory lane in 2018. Bowyer hopes he can add to those numbers at one of the Round of 8 races in Martinsville, Texas Motor Speedway in Fort Worth or ISM Raceway near Phoenix. If that happens, he won’t have trouble finding a post-race Busch beer. Is there any gloating at SHR over the 2018 performance? What are your thoughts on Martinsville? Should there be more Martinsville-type tracks on the circuit?